In product research videos, people will often reference the demand (ie 3000 units sold per month for the main keyword), and competition (ie a few of those in the top 10 with less than 50 or 75 reviews). The often neglected, and most important aspect of the product research is the profit per unit. Like the great rapper DJ Quik once noted, “If it don’t make dollars, it don’t make sense.” Hear hear! 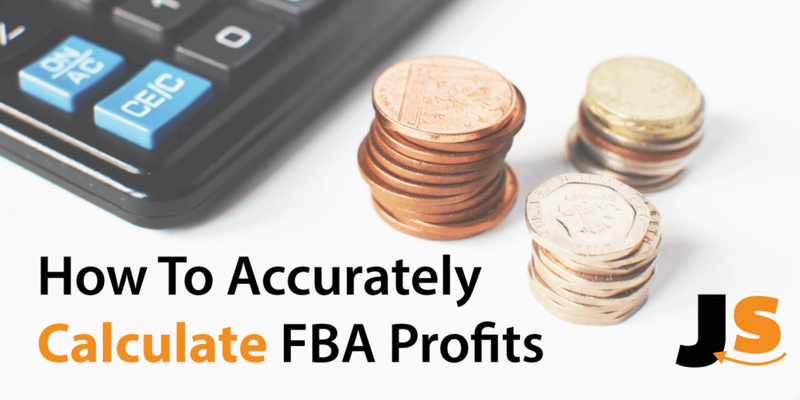 There are several ways to access and use an FBA profit calculator to help ensure that you are profitable with each sale, and I will review two of these methods. In this post, I will cover the steps you need to take to calculate an accurate profit per unit. Once you do so, you will be able to validate the viability of a product, and if it will yield the profits that you need in order to move forward with launching the product. I have also included a spreadsheet so you can plug in your specific figures to make the calculations easier for you. For the purposes of this exercise, let’s assume we don’t have all of the exact details for the product, but we are getting rough estimates to help us figure out whether the product can meet some basic profitability metrics. If it can be profitable, then we can pursue this further in the product research process. It is easiest to start with the revenue figure, so we can get an estimate of how much a customer will be paying for the product. You can fine-tune your pricing strategy with split testing down the road, but at the outset, it’s easiest to just take the average selling price of your competitors. The necessary evil, the pied piper, the dues paid to Uncle Sam (or should we call him Uncle Jeff…Bezos): the FBA Fees. These FBA Fees are what we pay in order to get our products listed on Amazon, have the benefits of pick, pack, ship, customer service, and more. Amazon Referral Fee: This is essentially the cost of having an active listing on Amazon, hence they “refer” customers to you. The fee is generally a percentage of the retail cost (differing by category). You can see the details for how Amazon calculates the fees at this page. Pick & Pack: The cost of getting your item from the warehouses, packing it (including the packing materials). This is basically covering Amazon’s labor costs in their warehouses. Weight Handling: This is the shipping cost to get the product to your customer. It is calculated by the product weight. When they advertise “Free 2 Day Prime Shipping” for any Prime and FBA product, guess who pays for it? Yup, you do as the seller. Monthly Storage: Pretty self-explanatory, calculated in cubic volume for storage on a per-month basis. Prep Service: If you paid for Amazon to apply labels like the UPC codes, it would be $0.30 per product. How do you estimate what these costs are for a given product? Suppose you are interested in competing against Jungle Stix and want to sell marshmallow sticks. 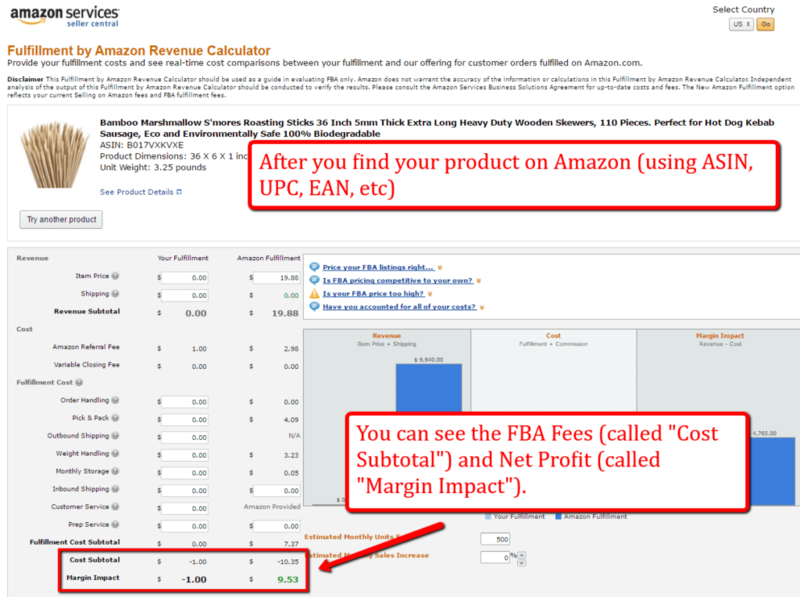 You would simply find the ASIN, UPC, or EAN of a comparable product, and plug it in to Amazon’s FBA Revenue Calculator. Once Amazon identifies the product, you can see what the individual fees are, what the overall fees are, and what the “net profit” is. It is a total of $10.35 in Amazon fees, which they subtract from the Item Price that I entered, which is currently $19.88. This leaves $9.53 in margin, which they term “Margin Impact”. If you have the Jungle Scout Pro Extension, you can pull all of this information up with one click. 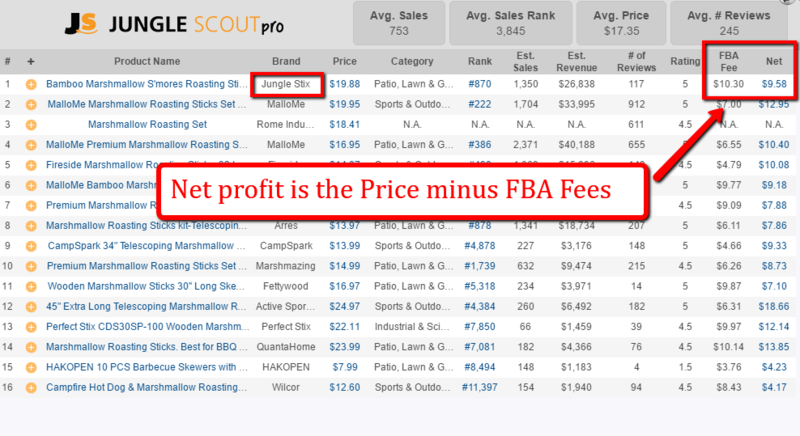 You will see the FBA Fees, and the Net Profit, which is the selling price minus the FBA Fees. Now let’s take this one step further. What is your actual profit, after you incorporate your Cost of Goods Sold? This is the money question (cheesy pun intended 😉 ). For simplicity, we will consider this the landed cost of the product, which is the cost of the manufacturing, packaging, importing, customs, shipping, and domestic shipping all the way to Amazon’s warehouse. One hidden gem of the Jungle Scout Pro Extension is that you can calculate these figures automatically. Simply click on the “Net Profit” figure for any product, and you can play around with different product costs and selling prices, to see how it affects your profit figures. The Calculator is Read Only access, but you can download it by going to File –> Download As, and from there choose your desired file type. There are a few additional expenses added in to the spreadsheet, so you can be more granular in your accounting. This includes Cost Per Click advertising, promotional giveaways, and if you would like, you can deduct some money (on a percentage basis) for refunds and returns. On average, you could expect to lose 2%-4% or so to refunds and returns (obviously this depends on product quality, your customer base, niche, and many other variables). One important thing that I should mention here: it is in your best interest to be conservative in your estimates. Assume that your selling price is on the lower end of what you wish to sell for, and assume that expenses will be 1.5x more than you estimate. This raises the bar for what is actually a profitable product to sell, so while you may reduce the number of potential products on your list, you are also increasing the likelihood of success when you do choose your product. When I launched Jungle Stix, the market looked like it would support a product selling for $27. And I did make some sales at $27. However, competition soon entered the niche, and I changed my selling price to $20. That 25% decrease in price is certainly a lot, and I am currently split testing the price to determine the most profitable price point, but it is simply a lesson that you have to be flexible to meet market conditions. However, if you follow these tips on proving profitability before you move forward with your Amazon product, I promise you that looking at your Income Statement, and seeing nice plump profit numbers will definitely bring you a pleasurable experience! If you have any questions about calculating profits or Amazon accounting, please drop them in the comments section below so I can try to help! Need a hand finding a product idea? Finding a great product idea is no longer like searching for a needle in a haystack. We've stacked hundreds of product ideas to make your life easier. I'm Ready To Start Selling on Amazon! I am buying a product from China and hoping to sell it on Amazon U.S, however I am a citizen and reside in Australia. What are the tax requirements I need to consider for this? Also, is there costs associated with bringing a product into China from U.S? If so how can I find out how much it would cost? Hi there! Great article! I’ve got a website launching this week and my overall profit margin is 31.1%. I will be running everything myself to start off but have reached out to 3PLs and researching FBA for potential future use. Would you say my 31% is something that would be applicable towards FBA or is that already too low of a margin? Im also trying to offer free shipping pver 75 on my own sales channel. Any insight would help and thanks in advance! I realize this article is older too hope youre still active! Ive purchased the JS Pro extensions but I dont see the FBA fees or net profit in the window after i click it. What am i doing wrong? If you click that 3-line stack in the upper left corner of the extension window, you can select the info you want to see. If you click on “Columns” you will find Fees and Net in there. Just hit save, which will close/reopen the extension and you’ll see the new info you selected. Great question it feels like something is missing. Was tariffs included to get the ROI figure? Hi Greg and Gen, on the amazon revenue calculator it says n/a by outbound shipping. How do i know how much amazons shipping service will end up costing me? hi, its says n/a by the outbound shipping on the amazon calculator, does that mean its not available because theyre not going to charge me? How do i figure out how much amazon will charge me? Your Tools are only for PL seller? I’m selling items that focus on Japan,and stockking from Japanese wholeseler. I want use your tool but I’m wondering that my products can be suitable with same way of PL seller. Could you give me your advice? Jungle Scout is not just for private label sellers, it is for any Amazon seller. In fact, we have a great webinar coming up showing how Jungle Scout can be used for Wholesalers. Details will be released shortly, stay tuned! Hi Greg and Gen, first off, thanks for always providing so much valuable info and resources!! I’m a new JS customer and soon to be new fba seller, and really excited to be diving in. I am however a bit confused by this profit calculator. Im considering a product that costs $2.70 (landed at amazon) and sells for $13. amazon fee would be $4.50. Net would be $8.50. So profit would be $5.80 p/unit. If I add $1 per sale to my product cost to account for PPC spending, then my cost goes up to $3.70. which still leaves me $4.80. In theory according to all that I’ve learned so far these sounded like good numbers. When I use a normal ROI formula: ROI = (return from investment – initial cost of investment) / initial cost of investment, the result I get is a ROI of %130 for this product. However when I input these same numbers into the profit calculator, it says that my ROI is %59. big difference there. what am i doing wrong or not account for? 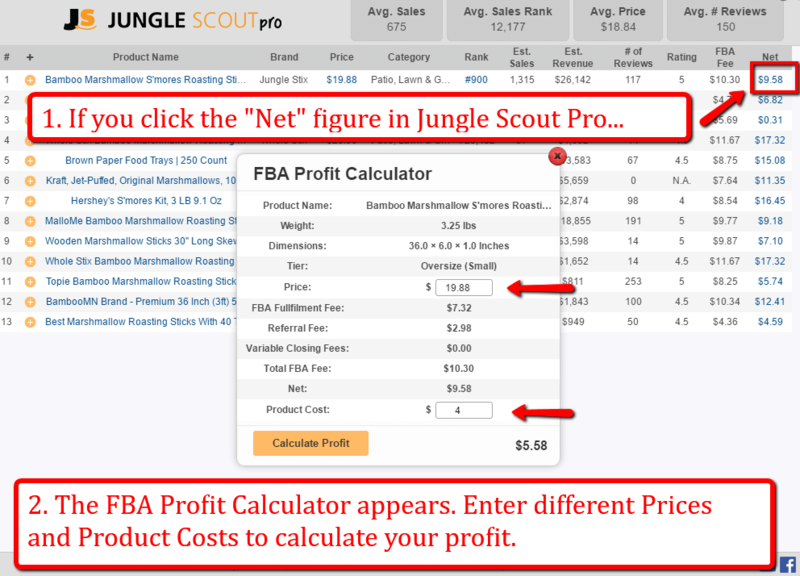 I was wondering if the FBA fee shown by your software jungle scout is the right fee? I mean, can i trust in this specific data to make my calculation or is just an approx amount? Other question is base on the aprox. sales that generate one item. It is a trusty value? What is the base of the number? Hey Kris! The FBA fee in JS should be the correct fee. I would also recommending double checking before you actually spend a bunch of money ordering inventory, however, for product research purposes is should be good to go. The sales numbers are estimates and should be treated as such. They’re normally pretty close. Great video, very informative, and well writing. Thank you for taking the time to explain the FBA calculator. I was finally going to order a test batch of 500 units after receiving multiple samples and getting my logo engraved, however it does not seem profitable. I am getting the product made at a little better than 1/3rd the cost however the profit margin % is very slim. What is the minimum final profit per unit that JS would settle for? (After shipping, getting the products made, FBA fees) $5? $2.5? Any advice would be appreciated, I have to contact a supplier back in a couple of days and not sure if I am going to follow through with the order now that I learned the FBA fees are expensive even for light products. Thanks for saving me a potential headache and $$$ with these calculations and resources. 10% profit margin is pretty slim. We normally shoot for a 100% ROI. With Jungle Stix, the landed cost is $4.20 and the profit/unit is around $5.70/unit. This is over a 100% ROI and the profit margin is around 28% since the fee’s for this oversized product are fairly large. First. Thanks for all your major advice professionally delivered all the time!! After i set up my API keys i’ll need to be logged in when i want to use those features ? or once it set up i can use without signing in as well ? Nico, that looks like a good caculator. Any chance on sharing the spreadsheet with the calculations? Great calculator! Can you please share the excel sheet? It would be greatly appreciated and make life so much easier. Right now I am doing everything with pencil and paper. By the way, are you selling the product for $30 or $25? I noticed a difference in the scenario price and “income” price. I have JS Pro, but as Brent said the FBA fee & net values are missing. I don’t know what Gen means by “have you connected your API keys?” Please give step by step instructions for Newbies to set up these fields – the profit calculator is a valuable tool I’d like to be able to use. Let us know if you still have any issues! Hi Peter, sorry for the confusion. If you have any issues, just let me know in the comments or email [email protected] and we’ll make sure you’re taken care of. Thanks Peter. Greetings Gen! I clicked the tab to have the product idea list sent to my email address but to no avail. I receive all other emails from you guys not sure why this didn’t come? Any thoughts in helping receive the list? Many thanks! Sorry about the inconvenience, not sure what happened. Can you please email us at [email protected] and we’ll get you what you need? Thanks! Hey John! Everyone does it a little differently, I normally add these into my product or shipping costs, however, feel free to adjust the spreadsheet accordingly to work better for you! Hi Greg, That was super informative, thanks for your help. Now, do I have to register a seller account with amazon before buying jungle scout extension? Besides, am ready to pay for both of them even though I have not opened my amazon account yet because I feel sought out my niche is more important than everything else. But if am wrong please let me know. Do you still have the jungle scout sales going on, if not what amount of discount are you willing to give me bearing in mind that am not in business yet , I am only preparing to start. This is great, but it doesn’t include the monthly storage fee like the fba calculator does. . .
Has anyone else found there to be a discrepancy between the seller central estimate for COGS and the actual? For eg. the calculator says my FBA fees based on an identical product will be $11. However, when I load up the shipping plan the seller-central estimate jumps to $19. The difference is practically my profit. My shipment is on it’s way so I can only wait and see. Thats strange! It seems to work OK for me. Is the product you’re using the seller central estimate for the same product as your selling? Are all your dimensions, weight, etc. correct? As always great stuff. However am I doing something wrong, in that I don’t see the FBA Fee & Net in my JS Pro? Is there a download I need to do? Let me know if you still can’t get it! That’s awesome to hear, thanks for the feedback!